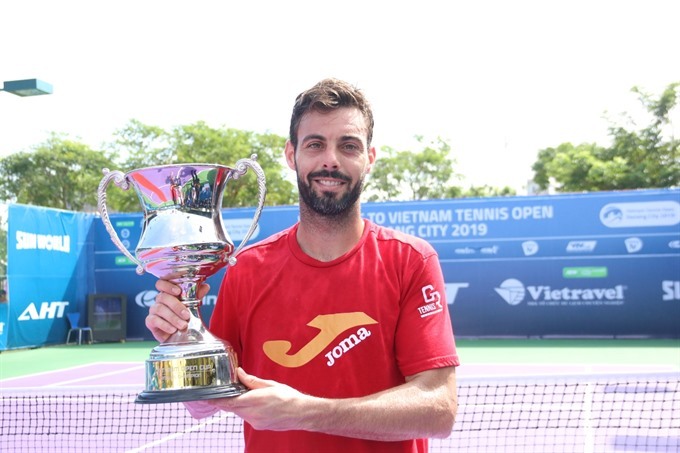 ĐÀ NẴNG — Top seed Marcel Granollers from Spain triumphed at the Việt Nam Tennis Open Đà Nẵng City 2019 on Saturday after an easy 6-2, 6-0 win over Italian Matteo Viola in the men’s singles final. Marcel, who is 96th in the Association of Tennis Professionals (ATP)’s ranking, cruised a 6-2 win in the first set before taking the second with score 6-0 and lifting the trophy. The Spaniard was awarded US$7,000 in prize money and 80 bonus points for his ATP’s ranking. In the men’s double final, Cheng Peng Hsien from Chinese Taipei/Christopher Rungkat of Indonesia beat Leander Paes of India/Mexican Miguel Angel Reyes Varela 3-6, 6-2, 11-9 to win title. Having won 6-3 in the first set, Cheng and Rungkat couldn’t continue their momentum losing second set. The men’s double final had to decide by tie-break series when Cheng and Rungkat edged out the opposition after a tense 11-9 victory. The double winners also took a $3,100 cash prize and 80 bonus points in the ATP rankings.